So I was all excited to blog about my RagnarDC race week preparation and blah blah blah but I was randomly scrolling through my IG feed and came across THIS and I just got so excited!!! Duluth was my back yard for 31 years, my playground, my running haven, my sanctuary… and part of the heart of downtown Duluth, or Duluth in general is that beautiful lift bridge over Lake Superior. On top of that, Grandma’s Marathon has been my favorite marathon in the whole world for my entire 7-going-on-8-year running career for an entire host of reasons – oh my gosh I can barely type I’m so excited!! They’re practically the best organized run I’ve ever been a part of, volunteer-wise and runner-wise. 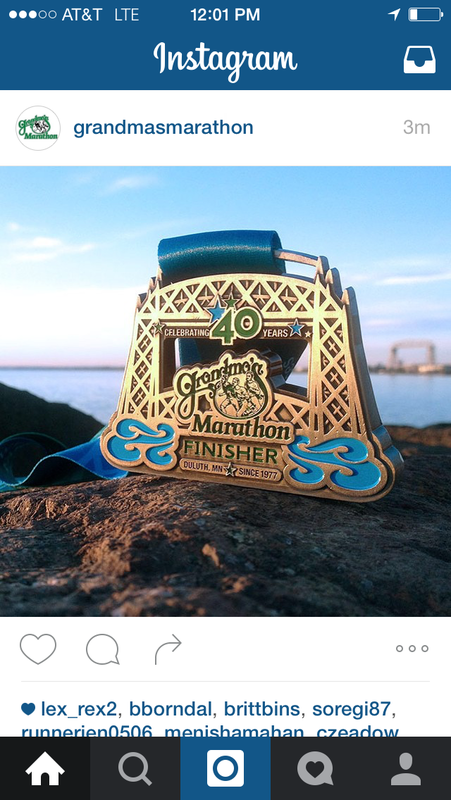 The course is UN-BE-LIEVABLE, scenery of Lake Superior shores the entire way… and now for their 40th Anniversary, they’re amping it up with hands down the most spectacular medal I’ve ever seen and you bet your damn skippy I’m coming for it! Leave me a comment: Where’s your favorite medal from? Do you run races based on their finisher medal? Do you run races for the swag? Admit it… you do. We all do!